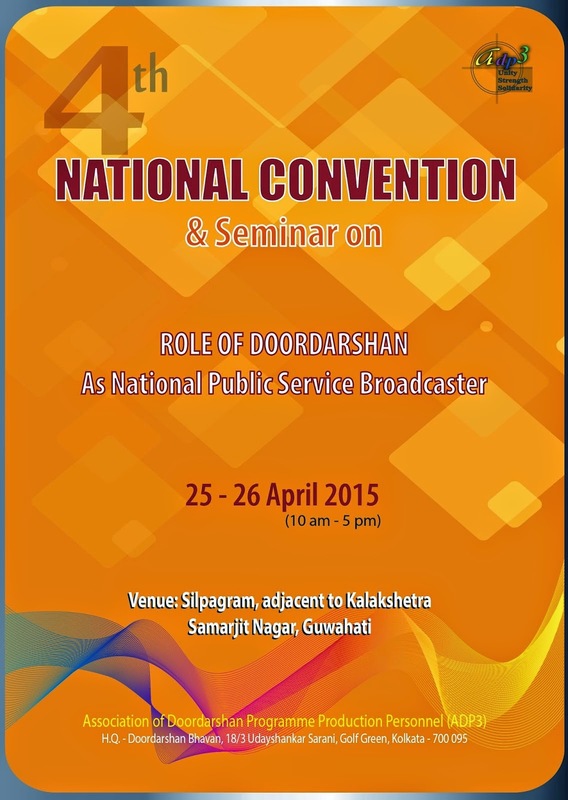 This is overwhelming that ADP3's 4th National Convention and Seminar on "Role of Doordarshan as Public Service Broadcaster" is going to be held at Silpagram, Near Kalakshetra, Guwahati on 25 - 26 April 2015, 10 am - 5 pm. At least two members from all DDKs may represent their kendra and may reach Guwahati by 24th April and also book their return tickets for 27th April. All Zonal Secretaries shall inevitably attend the Convention. This is high time to be assembled once again for our own interest as well as for the interest of Programme Wing of Doordarshan. The agenda points and minute to minute programme sequence will be finalised shortly. All comrades are requested to be prepared and purchase their tickets to visit DDK Guwahati. This is also requested to bring well-thought suggestions in writing to be compiled for making the activity list aftermath the convention. All members are requested to join the Convention and Seminar spontaneously and form the future of Doordarshan. We believe that the best days are yet to come. Suggestions from all corners are welcome. Keep in touch always. Watch our blog everyday.